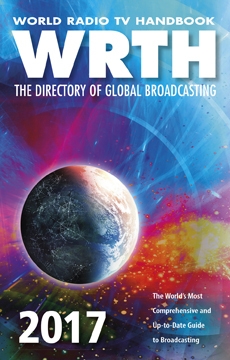 World Radio TV Handbook is the world’s most accurate and comprehensive directory of global broadcasting. It contains details by country of radio broadcasts and broadcasters on AM (LW, MW and SW) and FM, and details of national TV. The Features section for this 71st edition includes articles on Remote Receivers, a Pacific Radio Adventure, The Mighty KBC radio station, CKZN St John’s, the International Radio for Disaster Relief Project, and a reminiscence by Vagn Fentz who collaborated on the 1948-49 editions of WRTH. There are also reviews of the latest equipment, and other articles, information and maps. Equipment reviews: Icom IC-7300, Reuter Elektronik RDR55D, SDRPlay RSP, Wellbrook ALA1530LNP, Bonito AAS300.